Industry sources advised to Billboard the album had been streamed in excess of 1 billion times in the most recent tracking week, from June 29 to July 5. The previous record holder was Post Malone's "Beerbongs & Bentleys, which attained just under 700 million streams at the end of April. Billboard also advised Drake had set a one-week record for audio streams from a single album in the United States, with 745.92 million recorded during the period. By contrast, Post Malone's album managed 431.3 million. While Drake's top position on the Billboard 200 would most likely have occurred under earlier compilation rules, the week was the first under a new multi-metric consumption system. Measured in equivalent album units, it is comprised of traditional album sales, or a track equivalent album (TEA) of 10 individual tracks bought from an album, or from Streaming Equivalent Albums (SEA). Originally announced in October last year, the change primarily surrounds how SEA is calculated. While previously all streaming services were lumped together into a single category, SEA is now split between streams from paid subscription on-demand streams, such as those from Apple Music and paid tiers of other services, and ad-supported on-demand streams, like Spotify's free service or YouTube. Under the change, subscription-based streams have a greater weight, with 1,250 streams making up one SEA unit compared to 3,750 ad-supported streams. Billboard claims the shift in streaming strategy is "reflective of a global push to measure streams in a revenue-reflective and access based manner." In short, because artists and labels will gain more revenue from subscription-based streams than ad-supported versions, such streams should be given more weight. It is unknown exactly how much of an impact streaming made on Scorpion's sales, but Nielsen Music advises that out of 732,000 equivalent album units earned in the week, only 160,000 were from traditional album sales. 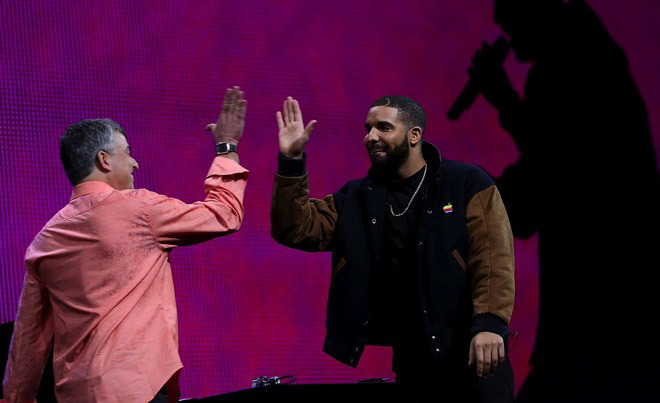 Apple Music is likely to have contributed significantly to the total, as it was recently revealed the album broke the service's single-day streaming record with more than 170 million streams. Main rival Spotify reportedly only managed 132 million streams in the same period, despite having a considerably higher total user base of free and paid users. On Friday, a report surfaced claiming Apple Music had just overtaken Spotify in popularity in the United States.